This audio file is an excerpt from a BBC interview on January 9, 2009, with Colonel Richard Kemp CBE, a former Commander of British forces in Afghanistan, and a senior adviser on army issues to the British government. The assessment by an independent military expert will be of interest to all persons sincerely interested in understanding the Israel incursion into Gaza. "I don’t think there has ever been a time in the history of warfare when any army has made more efforts to reduce civilian casualties and deaths of innocent people than the IDF is doing today in Gaza". See the complete transcript in the right hand column below. “What was behind my comments? “Apart from basic decency and humanitarian considerations, the commanders of the Israeli Defense Forces knew how vital to a counterinsurgency conflict is winning over the hearts and minds of the people, especially in a conflict where they could be sure that killing innocent civilians is exactly where the enemy would be trying to lure them to do. “Because Hamas (like Hezbollah in Lebanon, like the Taliban in Afghanistan and like Al Qaeda and the Shia militias in Iraq), use their own people as both tactical and strategic weapons of war. “They used them on the tactical level as human shields, to hide behind, to stand between Israeli forces and their own fighters, sometimes forcing women and children to remain in the positions that they would use to launch attacks from. “In these most difficult circumstances, the IDF commanders took unprecedented measures to minimize civilian casualties. When possible, they left at least four hours’ notice to civilians to leave areas designated for attack, an action that handed a distinct advantage to Hamas. “The Israelis dropped a million leaflets warning the population of impending attacks, phoned tens of thousands of Palestinian households in Gaza urging them in Arabic to leave homes where Hamas might have stashed weapons or be preparing to fight. Similar messages were passed on in Arabic on Israeli radio broadcasts. “But despite Israel’s extraordinary measures, a number of innocent civilians were killed and wounded. This was inevitable. Let us not forget: Hamas was deliberately trying to lure the Israelis to kill their own people. “Many have contradicted my assertion about the IDF. But no one has been able to tell me which other army in history has ever done more to safeguard the rights of civilians in a combat zone. “In fact, my judgments about the steps taken in that conflict by the Israeli Defense Forces to avoid civilian deaths are inadvertently borne out by a study published by the United Nations itself, a study that shows that the ratio of civilian to combatant deaths in Gaza was by far the lowest in any asymmetric conflict in the history of warfare. “The UN estimate that there has been an average three-to-one ratio of civilian to combatant deaths in such conflicts worldwide. Three civilians for every combatant killed. “That is the estimated ratio in Afghanistan: three to one. In Iraq, and in Kosovo, it was worse: the ratio is believed to be four-to-one. Anecdotal evidence suggests the ratios were very much higher in Chechnya and Serbia. “In Gaza, it was less than one-to-one. “This extremely low rate of civilian casualties flatly contradicts many of Goldstone’s original allegations, and the bleating insistence of various other human rights groups about Israel’s alleged crimes against humanity. “As with Operation Cast Lead, the tragedy of the Gaza Flotilla incident, one year ago, has been widely exploited as part of the conspiracy against Israel. “Today, Israel faces a conspiracy of delegitimization, which aims to give validity and justification to attacks on Israel by groups such as Iran’s proxies Hamas and Hezbollah, allowing them to strike at Israel with impunity, and encouraging the view that any retaliatory or defensive measures by Israel are by definition disproportionate and should be criminalized. “The more traction this objection is allowed to gain, the greater the instability between Israel and her neighbors. And the less chance of any lasting peace, the more that blood will be shed on all sides in the region. “I telephoned an Israeli contact of mine, who arranged for a Brigadier General in the IDF to meet with me in London. This man (at the time, serving as a full-time commander of an operational unit) took the time to fly to Britain within two days. For four hours, we sat in a lobby in a London hotel. He spoke; I took notes. And it was from that meeting that the entire counter-suicide-bombing strategy used by the British army was devised. “I think Israel has very little choice other than to carry on with its military operations until it reaches the conclusion it needs which is to stop Hamas from firing rockets at its people in its territory. “It has set out on this operation to do that and the civilian and military deaths on all sides of course are absolutely tragic. But Israel doesn’t have any choice apart from defending its own people. “Until such arrangements are in place, not just for Hamas to accept that they must stop attacking Israel territory, but also that any such agreement is enforced. Until those arrangements (are enforced) Israel has no choice but to completely dominate the area. “I think – I would say that from my knowledge of the IDF and from the extent to which I have been following the current operation, I don’t think there has ever been a time in the history of warfare when any army has made more efforts to reduce civilian casualties and deaths of innocent people than the IDF is doing today in Gaza. “When you look at the number of civilian casualties that have been caused, that perhaps doesn’t sound too credible – I would accept that. “However, Hamas, the enemy they have been fighting, has been trained extensively by Iran and by Hezbollah, to fight among the people, to use the civilian population in Gaza as a human shield. “Hamas factor in the uses of the population as a major part of their defensive plan. So even though as I say, Israel, the IDF, has taken enormous steps - and I can tell you about some of those if you’re interested - to reduce civilian casualties, it is impossible, it is impossible to stop that happening when the enemy has been using civilians as a human shield. “Well of course I can’t really comment on the detail of that – I don’t have any of the facts available on that. And I have no doubt that any allegations like that will be looked into very seriously by Israel. “Of course, the Israel Army operates under a strict code of conduct and are answerable to the Israeli government and the Israeli courts. And if it turned out that there was a deliberate crime committed I have no doubt that the people would be held to account. They would be answerable to an Israeli court. “But of course, it’s not just a matter of the IDF trying to prevent casualties in a situation where the enemy is using them as a shield, but it’s also ... war itself. 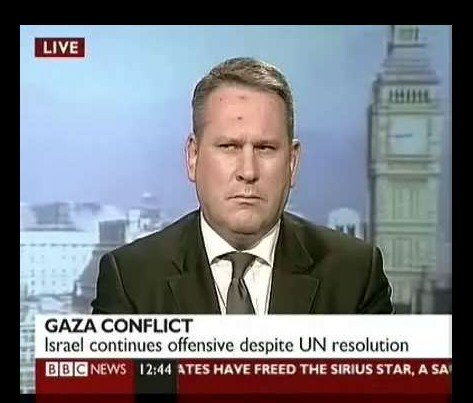 To their discredit, the UN fact-finding mission to Gaza rejected my recommendation to invite Colonel Kemp to give expert military evidence on the fighting in Gaza. Fortunately however, UN Watch arranged for him to address the UN Human Rights Council: 12th Special Session on October 16, 2009 in Geneva. This is what he said. "I am the former commander of the British forces in Afghanistan. I served with NATO and the United Nations; commanded troops in Northern Ireland, Bosnia and Macedonia; and participated in the Gulf War. I spent considerable time in Iraq since the 2003 invasion, and worked on international terrorism for the UK Government’s Joint Intelligence Committee. Mr. President, based on my knowledge and experience, I can say this: During Operation Cast Lead, the Israeli Defence Forces did more to safeguard the rights of civilians in a combat zone than any other army in the history of warfare. Israel did so while facing an enemy that deliberately positioned its military capability behind the human shield of the civilian population. Hamas, like Hizballah, are expert at driving the media agenda. Both will always have people ready to give interviews condemning Israeli forces for war crimes. They are adept at staging and distorting incidents. The IDF faces a challenge that we British do not have to face to the same extent. It is the automatic, Pavlovian presumption by many in the international media, and international human rights groups, that the IDF are in the wrong, that they are abusing human rights. The truth is that the IDF took extraordinary measures to give Gaza civilians notice of targeted areas, dropping over 2 million leaflets, and making over 100,000 phone calls. Many missions that could have taken out Hamas military capability were aborted to prevent civilian casualties. During the conflict, the IDF allowed huge amounts of humanitarian aid into Gaza. To deliver aid virtually into your enemy's hands is, to the military tactician, normally quite unthinkable. But the IDF took on those risks. Despite all of this, of course innocent civilians were killed. War is chaos and full of mistakes. There have been mistakes by the British, American and other forces in Afghanistan and in Iraq, many of which can be put down to human error. But mistakes are not war crimes. More than anything, the civilian casualties were a consequence of Hamas’ way of fighting. Hamas deliberately tried to sacrifice their own civilians. Mr. President, Israel had no choice apart from defending its people, to stop Hamas from attacking them with rockets. And I say this again: the IDF did more to safeguard the rights of civilians in a combat zone than any other army in the history of warfare. Those who claim the IDF also deliberately targets civilians don’t have to believe the official spokesman’s denials: they could speak to someone such as Colonel Richard Kemp, who commanded British Army campaigns in Afghanistan and Northern Ireland, and was most recently senior military adviser to the Cabinet Office. Kemp told me that “Hamas deploys suicide attackers including women and children, and rigs up schools and houses with booby-trap explosives. Its leaders knew as a matter of certainty this would lead to civilian casualties if there was a ground battle. Virtually every aspect of its operations is illegal under international humanitarian law – ‘war crimes’ in the emotive language usually reserved for the Israelis”. Colonel Kemp points out that if the IDF had no regard for civilian lives it would never have leafleted and telephoned residents in Gaza, warning them when it was about to attack their area: after all, that also gives Hamas notice – hardly the act of an army devoted to military victory at all costs. Similarly, the IDF’s unilateral commitment to a daily three-hour ceasefire to permit the evacuation (to Israel) of casualties, and for the passage of “humanitarian aid”, also allows Hamas time to regroup and redeploy for future attacks. Of course, none of these arguments can penetrate the brains of the superannuated Stalinists, vicarious jihadists and attention-seeking actors and pop stars who think it’s cool to go on marches chanting, “We are all Hamas now”. Even if these luvvies might not be aware that on Christmas Eve Hamas legalised crucifixion as a punishment for those who “weaken the spirit of the people”, and have been shooting such political enemies in the head when they find them in hospitals conveniently injured by Israeli bombing raids, they still deserve to be dismissed as useful idiots for a depraved death cult. This is not exactly the classical doctrine of deterrence: it’s supposed to stop people attacking you in the first place. Yet the Israeli attack on Gaza is part of the same policy of delayed deterrence. Paradoxical though this might seem, it is also essential if the process towards an independent Palestinian state is to have a future. For until the people of Israel believe that such a state – including the heights of the West Bank, which overlook Tel Aviv – is not a threat to their own existence, they will never support a government which abandons those territories, won in an earlier war of self-defence. If you believe otherwise, go to Yad Vashem.